If you are a Windows Phone user, you should be familiar with Zune Software. Apart from Windows Media Player, Microsoft Zune provides a good media player alternative for all iTunes haters out there. Zune Software has a great user interface and is one of the first Microsoft products to feature Windows’ special tile based design. Zune Software is capable of playing a lot of audio and video formats and can easily become your favorite media player on the Windows platform. Users living in US, UK and a select list of some countries have a special feature available to them. They can subscribe to a Zune Pass which allows them unlimited download and streaming from the Zune Marketplace as long as the Pass is valid. Users without the Zune Pass can still access the Marketplace and browse through the online library. What’s more, they get free 30 second previews of all items available in the Marketplace. But here’s what is available for free: the entire Zune podcast library. Here, you can subscribe to unlimited podcasts and download them to your computer and your Windows Phone – for free. However, if you reside in a country where Zune services aren’t available, you won’t see the Marketplace option on your Zune Software. You will only be able to play music and videos from your local library. Not too exciting isn’t it? You can still unlock and enable the Zune Marketplace in unsupported countries. Although you cannot purchase a Zune Pass and subscribe to unlimited music and videos, the preview feature as well as Podcasts will be available. So you can do anything that a typical US based Zune user could do without a Zune Pass. Warning: The following tips involve modification of the Windows Registry. The Registry is very critical to the Windows Operating System. Modify registry values very carefully as it could even brick your System. 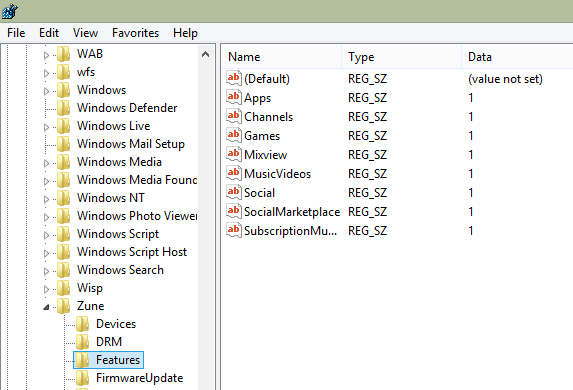 Go to Start >> Run and type “Regedit” and hit Enter to launch the Registry Editor. Go to HKEY_CURRENT_USER >> Software >> Microsoft >> Zune >> Features along the left folder tree. On the right hand panel, you will see a lot of keys listed representing the various features. Each of these feature keys are assigned a value containing a list of area codes. Set all the keys (except the first one) with value 1. Close the Registry Editor and open Zune Software. A new pop up will appear notifying that the “Features Have Changed”. And Volla! 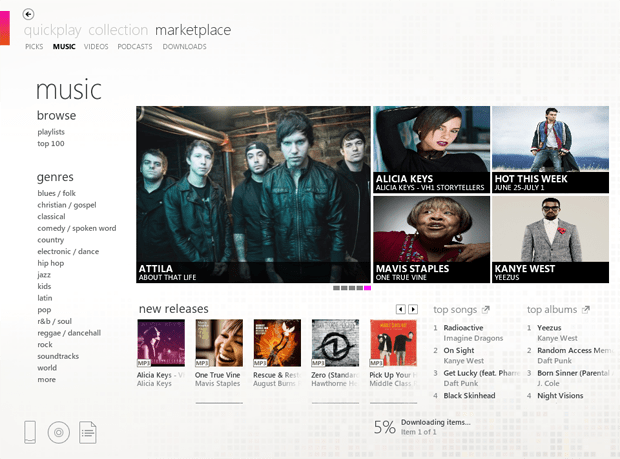 The MarketPlace tab will now be available on your Zune. 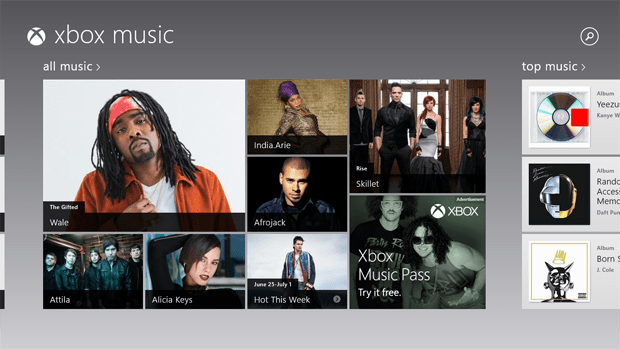 If you are using Windows 8, you must be familiar with the Music and Video Modern apps that come along pre-installed with it. These apps, which have been regarded as the next generation of Zune, have their own Xbox Home screens. The Home screen displays the latest trends in music and video and feature Artist Radio, Biography and other online features. If you live in any country outside supported regions, this screen is missing from the apps. To bring back the Xbox Music and Video Home screens, all you have to do is change your System location to a supported region. For instance, you can set your System region to USA by going to Control Panel >> Region >> Location tab and change the Home Location to United States and press OK. And from now on, whenever the Music or Video app is launched, it will start in the Xbox Screen. It is to be noted here that some Xbox features like Smart DJ and Artist Radio might still be unavailable for you as Windows 8 apps can track your location. But you will be able to see New Releases previews from the Home screen. On another note, the Xbox Screen adds a sense of style to your Music and Video apps.